Answer: Since you won’t be the only person reading my answer to your question, John (oh sweet God, MidCurrent and I hope not…), I’ll start by defining what a soft-hackled fly, or just “soft-hackle,” is, for the sake of those who might not know: it’s a simple body of absorbent fur or buoyancy neutral floss or both, maybe with a rib but probably not, and a long and supple hackle such as partridge flank or hen saddle, all tied (typically) on a heavy wire hook. No wings and (also typically) no tail. A fairly elemental pattern overall. You asked for a fly an intermediate-level tier could handle: that’s eight out of ten soft-hackles. I’m confident I’ve got the parameters of your question right, John, so that you and I are together but, again, for everyone else who is (I pray) reading this, I’ll present them here. While soft-hackles can be excellent for such pan-fishes as bluegills and pumpkinseeds (I’ve proven that to my own satisfaction) and for trout in lakes (again, proven), they’re mainly for trout in streams. And there are several ways to fish them in streams—directly across stream with the greased-line method, upstream, and more—but most of us fish a soft-hackle angling downstream so that the fly swims across the current, slowed in its progress by occasional upstream mends of the line. A soft-hackled fly is a typically general sort of imitation. Its body is usually stout enough to suggest caddis pupae but slim enough for mayfly emergers. It supple hackle-fibers waving in shifting currents represent the legs of either insect (and the long antennae of caddis pupae). So, yeah, it’s mainly an imitation of mayflies and caddis. These two bugs engage in a lot of swung-soft-hackle-simulating behavior: when hatching, and when female adult caddis dive into the water and swim down to deposit their eggs. But when do you pass on a nymph or dry fly to instead swing a soft-hackle fly? Normally, for me, it’s pretty simple: if trout are showing but not truly rising, that is, making a churn at the surface, maybe showing a dorsal fin but not a nose, never leaving that bubble on the water that tells of a gulp of insect and air, I tie on a soft-hackle and start swinging it through the fish. It’s amazing how the action can change once you figure out those rising trout aren’t really rising at all and you show them a soft-hackle. Once, on a shin-deep flat of light current on Montana’s Missouri River, I failed and failed with dry flies and floating emerger-flies until I realized the browns and rainbows were taking just short of the surface. I didn’t recognize the hatch in the fading light and didn’t have time to figure it out, so I put up a particularly versatile soft-hackle pattern (one similar to a fly I’ll get to, the March Brown Spider) in a middling size (probably a 14), and…hooked a fish on almost every swing. How do you question results like those? That’s drama. I’ve seen such drama with soft-hackles and hatches many times. So there you go: scenario #1., fish soft hackles when trout aren’t rising but are feeding just beneath the surface during a mayfly or caddis hatch. Try to match the insect’s size and coloring, but it you don’t know what those are, start with something in average trout-bug size in a bland color. Here’s scenario #2: search through a stream with a soft-hackle when no bugs appear to be hatching and no trout are rising. Swing the fly through all the pockets, runs, pools, riffles, through everything that might hold fish. 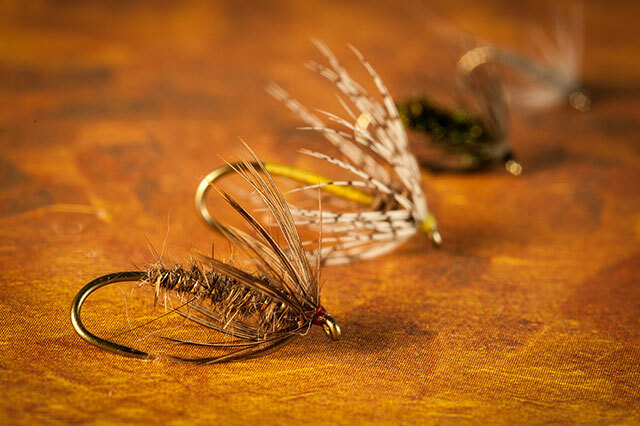 Most fly fishers prospect streams with a nymph, sometimes with a dry fly or floating emerger, occasionally with a streamer—but there are times when a soft-hackle will do it best. And on some streams a soft-hackled fly fishes best often, on others rarely. You just have to keep an open mind, and experiment. Those two scenarios should be enough to keep you busy for a long time, John. If you want to explore other ways to fish the simple and venerable soft-hackle, check out my friend and fellow author Dave Hughes’s book Wet Flies. Dave’s a soft-hackle addict; he knows what he’s talking about when he speaks on that subject. I’ve learned a lot about soft-hackles and how to fish them from Dave. Absolutely worth a mention: with swung soft-hackles, do not set the hook. Let the trout tug it home—all you do is hold the line firmly until the trout starts to run. So do I. With its earthy mix of tans and browns, it seems to effectively suggest more insects than any other soft-hackle can. Besides, the sparkle of its rib, like the sparkle of an insect struggling from its shiny-tight shuck glistening with squeezed-out gas bubbles; the living quality of its soft, furred body—it’s just an elegantly simple and simply effective design. Bead (optional): A standard copper or black metal bead (not tungsten) to help hold the fly down against the current. Thread: Orange (tan or brown seems more logical to me) 8/0 or 6/0. Hackle: Natural-brown partridge or mottled-brown hen saddle. (Partridge looks great, hen saddle’s easier to manage. Both catch trout.) I like to strip the lower side of the feather, wind it back towards the body in two or three turns, and then wind the thread forward through it to toughen it. All trout-stream fly fishers (which is to say probably at least 80% of all fly fishers) should carry and know how to fish soft-hackled flies and, when conditions are right, should fish them.